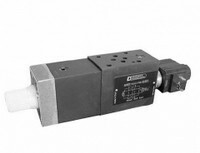 The RLM3 modular valve allows the control of the fast/slow flow through use of an open/close solenoid valve.The adjustment of the flow is carried out with the RPC1 valve with six adjustment ranges. 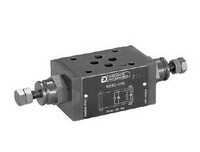 This valve is compatible with the NFPA D03. This is a flow restrictor valve with built in check valve for reverse free flow, made as a modular version with mounting surface according to the CETOP, ISO and NFPA D05 standard. The RPC1*/4M valve is a flow control valve with pressure and temperature compensation, made as a modular version with mounting surface according to the CETOP, ISO and NFPA D05.